Earlier this year, we looked at the influence Ruud Gullit had in establishing white shorts and socks as first-choice items at PSV. The red-white-white format took them to European glory in 1988 – though they wore all-white against Benfica’s all-red in the final – but adidas sought to shake things up at the start of 1989-90. 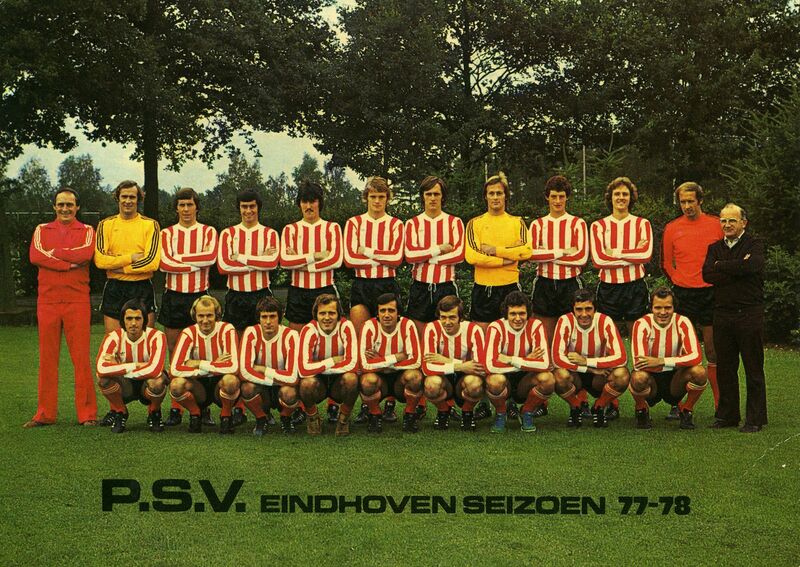 Nowadays, we associate the Dutch club with stripes, and they had them in the 1970s too, but at the time this was quite a departure, especially given the ‘barcode’ nature of the design. The shirt was also notable for the unusual placing of the club crest on the left sleeve. However, having been used in pre-season and three of the opening four league games, against Roda JC, Den Bosch and NEC Nijmegen – winning only the latter – the previous kit returned for the home clash against Ajax on September 10, a 2-0 win. However, as well as the new striped home, adidas had also supplied a change kit in the same style but white and blue. That was received even worse than the home, as it was never worn competitively – to the extent that we don’t know what the shorts and socks would have been (logic would say blue, or else both kits would be very white). Instead, they had stuck with lighter blue away kit from 1988-89, in the same style as the home with a wrapover round neck and piping in the fabric. 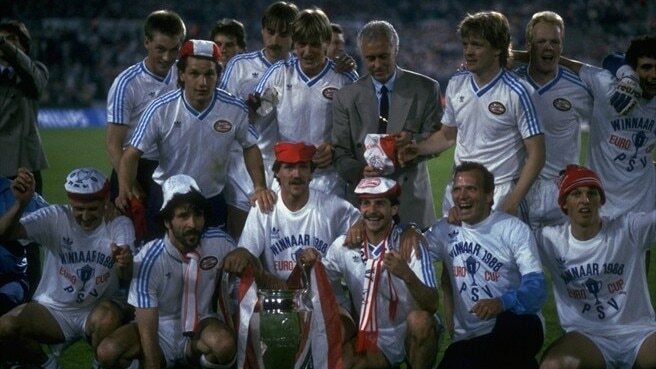 Having won the 1988 European Cup in a blue-trimmed white kit, PSV retained that colour-scheme in 88-89 as well, and that shirt was put into action for one game in 89-90, away to Feyenoord in December, with the blue shorts and socks. In the spring of 1990, another previously-used change kit, a reversal of the home shirt, used against Volendam, Bayern Munich, Sparta Rotterdam and Haarlem. Red shorts – unstriped, like the white and blue sets – and socks were available, though only used with the home shirt, including the game away to Ajax, perhaps surprisingly. That was in February – all-red was worn at Groningen, too – but adidas had returned to the stripes idea, albeit narrower on a largely red shirt, and this new jersey was first seen in the home European Cup game against Bayern (who wore white shirts, blue shorts and red socks). So popular would this shirt prove that it would be retained until the end of the 1993-94 season, during which time PSV won two league titles. While PSV wouldn’t win the league in 1989-90, they did win the KNVB Cup for the third year in a row, beating Vitesse Arnhem in the final. That was on April 25, but at the start of that month they travelled to Arnhem for a league game and wore red shorts but both teams had white socks. For the final – and the game away to Fortuna Sittard three days beforehand – they used the new shirt with red shorts and socks. The remaining combination with that shirt, white shorts and red socks, was seen in the Champions League game against Porto in 1992-93 – but that season is worthy of an article of its own, coming soon.